Metal-detecting between 2005 and 2012 recovered Late Saxon, medieval and post-medieval pottery sherds; Roman, medieval and post-medieval coins; medieval and post-medieval jettons and tokens and Iron Age/Roman, Roman and Late Saxon to post-medieval metal objects. 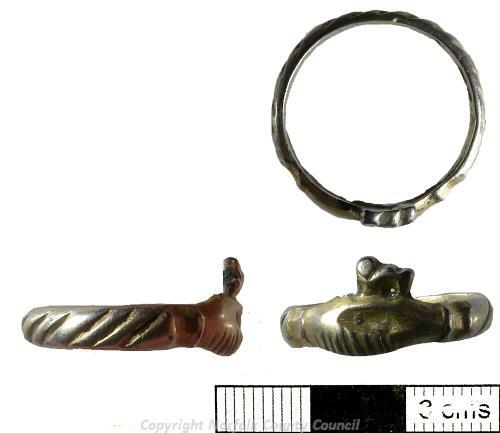 The metal finds include an Iron Age/Roman penannular bracelet; a fragment of Roman Trumpet brooch; a Roman/Early Saxon buckle; a Late Saxon disc brooch; medieval dress accessories, a finger-ring, casket key, pilgrims badges and a spur; medieval/post-medieval lead cloth seals, a mount, ring and rumbler bell and post-medieval dress accessories, harness mounts, a book clasp, purse bar and cloth seal. February-March 2005. Metal-detecting, area extended to whole field. Three medieval and two post-medieval coins, one medieval and one post-medieval jetton. Five medieval and one post-medieval coins. Late Saxon, medieval, post-medieval and undatable pottery sherds. A. Rogerson (NLA), 6 January 2007. 3 Roman and 1 medieval coins. A. Rogerson (NLA), 30 January 2007. 1 medieval and 3 post-medieval coins, medieval and post-medieval objects. A. Rogerson (NLA), 07 March 2007. 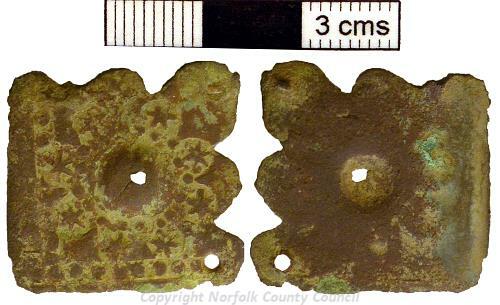 2 medieval coins & 2 post-medieval weights. 3 medieval and 1 post-medieval coin, medieval and post-medieval metal objects, 2 post-medieval jettons. 2 medieval and 2 post-medieval coins, medieval and post-medieval metal objects. A. Rogerson (NLA), 11 January 2008. 1 Roman and 3 medieval coins, medieval and post-medieval metal objects, post-medieval jetton. A. Rogerson (NLA), 6 March 2008. 3 medieval and 3 post-medieval coins, medieval jetton, post-medieval coin weight and tokens, medieval and post-medieval metal objects. A. Rogerson (NLA), 11 April 2008. 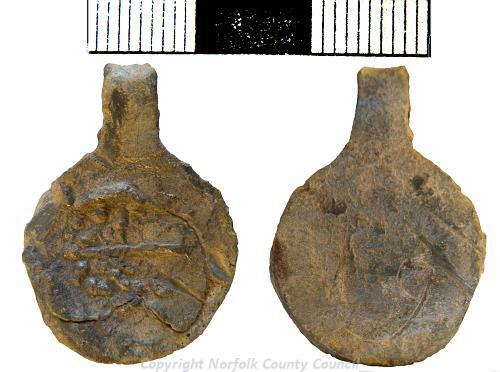 Medieval coin, buckle, belt or furniture mount, seal matrix, post-medieval coin, token and cloth seal. 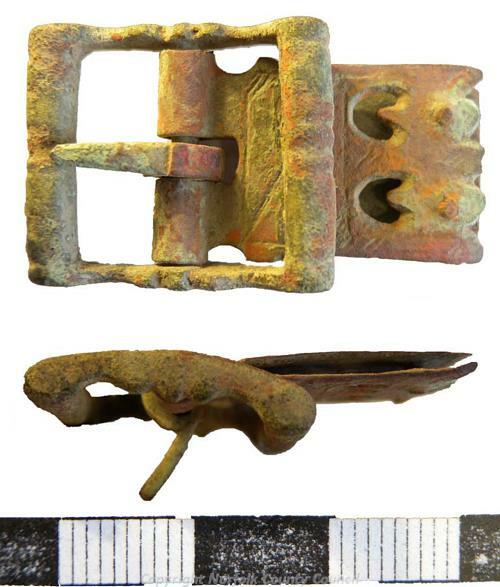 1 medieval coin, medieval buckle & post-medieval jetton. 3 medieval and 2 post-medieval coins, post-medieval token, medieval lead weight, buckle, an unusual Limoges buckle (S2), post-medieval buckles and a belt or harness mount. 6 medieval and 7 post-medieval coins; post-medieval coin weight; Romano-British/Early Saxon buckle, medieval and post-medieval metal objects. 1 Roman and 3 medieval coins; medieval (S3), medieval/post-medieval and post-medieval metal objects, post-medieval token. A. Rogerson (NLA), 26 March 2010. 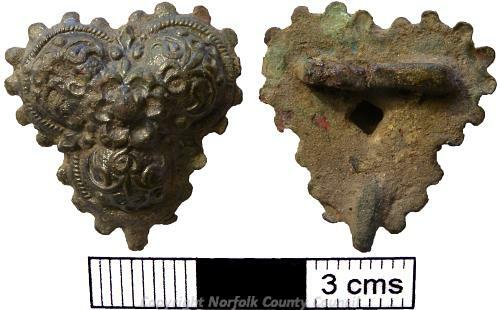 Medieval and post-medieval metal objects and a post-medieval jetton. 1 Roman, 1 medieval and 3 post-medieval coins, Iron Age/Romano British, medieval and post-medieval metal objects. 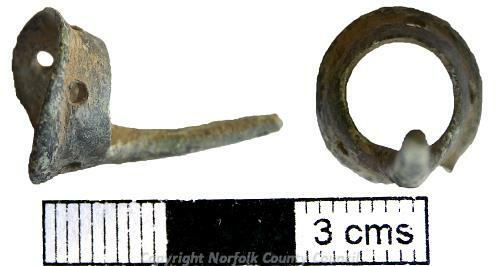 post-medieval token and jetton. See lists & map in file. Medieval and medieval/post-medieval metal objects, 2 post-medieval tokens and 1 jetton. 1 Roman, 2 medieval and 3 post-medieval coins, medieval and post-medieval metal objects. A. Rogerson (HES), 10 March 2011. One Roman, two medieval and three post-medieval coins, four post-medieval tokens, medieval and post-medieval metal objects. Three medieval and two post-medieval post-med coins, Roman, medieval, medieval/post-medieval and post-medieval metal objects. S. Ashley (HES), 12 December 2011. Before 12 November 2012. 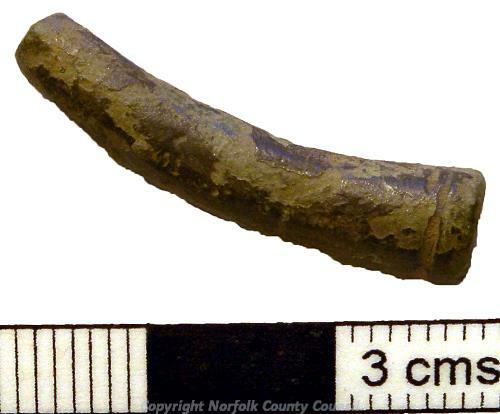 Metal-detecting. . 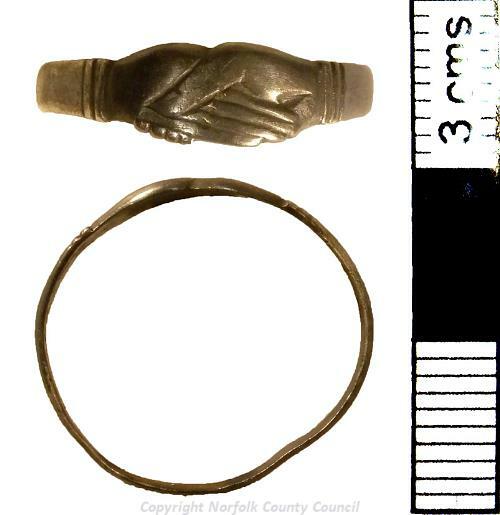 Medieval silver gilt 'Fide' finger ring and a buckle frame. <S1> Illustration: Gibbons, J.. 2006. Drawing of a Middle/Late Saxon copper alloy disk brooch.. Film. 2:1. <S2> Illustration: Gibbons, J.. 2009. 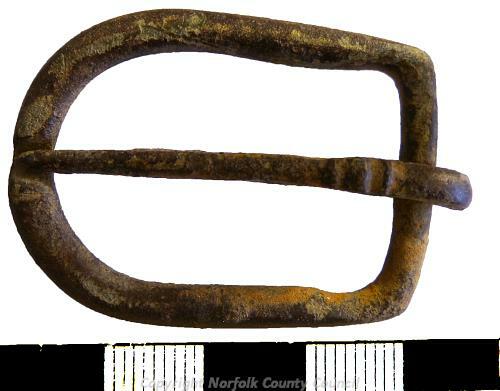 Drawing of a medieval buckle.. Film. 2:1. <S3> Illustration: Gibbons, J.. 2010. Drawing of a medieval buckle.. Film. 2:1.